Around this time 3 years ago, I made a decision to end discernment to religious life. It seems that I was doing the call for a priest who believed that I was called to this vocation. Deep down inside, I knew God was calling me to a different lifestyle. Fast forward to 3 years later, I’m engaged to be married. My fiancé and I await the day when we start marriage preparation. While there are people who are excited for us, there are those who don’t believe we should be married at all. Some people believe that I am still called to religious life especially a couple of priests. Confusion and doubts settle in my heart. With help from the Holy Spirit, I was guided to read this Sunday’s readings for Mass. Throughout his life, Jeremiah learned how to trust in the Lord in spite of persecution from others. His vocation journey was full of twists and turns; he eventually accepted God’s call to speak the truth…to be a prophet in a world of darkness. I knew I had no decision but to trust in the Lord. My fiancé and I pray often, especially during our courtship. We also went to adoration to ask for His will for us. We both asked the Lord to give us fortitude, peace, and trust. We freely made a decision to marry; we believed that God called my fiancé and I to marriage no matter what the world thinks. All of us are called to holiness. God asks each of us to use our gifts and talents that He gives us to use for His glory. The marriage vocation is a chance for a man and a woman to lead each other to the Lord. Also, they reach out to their offspring and lead them to the Lord. The Father drew me to this vocation because He knew that I have a heart to lead others to His Son. My fiancé and I look forward to serving together as a couple in the Catholic Church. 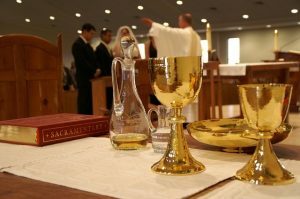 We will assist at Mass by being Extraordinary Ministers of Holy Communion or read one of the readings of the day. We both love to pray, especially before the end of the day. We encourage one another to be more Christlike. Whether one is in religious life, single life or married life, we are called to be holy and encouraging others to follow Jesus. All vocations are pleasing to the Lord. He invites us to share, encourage, pray, and love one another. If you are at a crossroads of making a decision about your vocation, talk to the Lord. A friend of mine told me to go to adoration to listen to God’s voice. She told me not listen to the voices of friends, priests, and others; only listen to God’s voice. Going to adoration has helped me to listen to God’s voice especially when I was discerning with the religious community. 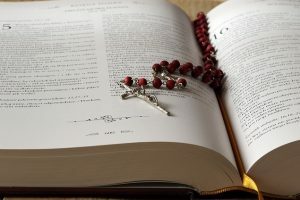 I continue to go as a lay Catholic; I learn how to trust in the Lord’s will for my life.